I became involved in the fight against corporate education reform in March 2012 as part of the effort to recall Bobby Jindal as Louisiana governor. With the backing and influence of former Florida Governor Jeb Bush, Jindal had the Stepford-household allegiance of most of the 2012 Louisiana legislature, which had in March 2012 advanced with lightening speed Acts 1 (“Teacher Tenure” Law) and 2 (Vouchers). Also in late 2011, Bush had helped Jindal seat a state ed board (BESE) that would approve Jindal’s choice for corporate-reform-promoting state superintendent, Teach for America (TFA) ladder climber, John White. In 2012, our efforts to recall Bobby Jindal did not work, but it is January 11, 2016, and he is gone now. Jindal left Louisiana in a major budgetary crisis, and he used his position as governor to try to advance his own career, one that he hoped would lead to the White House either in 2012 or 2016. What also did not happen was the assumed shoe-in of another Republican who puts his career first, US Senator David Vitter, as next Louisiana governor. When Vitter lost to Edwards, he announced that he would not run again for the US Senate, and as he made the announcement, the silent message was that not running again was an idea that likely originated with an embarrassed Republican National Party. And concerning the invisible presence of Republican Jeb Bush in the business of Louisiana education reform: As it stands for Bush’s 2016 presidential hopes (which also once appeared to be a shoe-in), in Republican polls dated 12/16 to 01/08, Bush is at a lame 3.8 to Donald Trump’s 34.0, Ted Cruz’s 20.0, and Marco Rubio’s 11.0. All of the above was on my mind as I watched the January 11, 2016, inauguration of Louisiana Governor John Bel Edwards on WDSU.com. It is the first time I have watched a gubernatorial inauguration. As it so happened this time, the one time I was most eager to watch, I had a break in my teaching schedule and was able to view the entire event. Invisible former Louisiana governor Jeb Bush was there, dressed down (for the campaign trail?). So were former Louisiana governors Edwin Edwards, Buddy Roemer, Kathleen Blanco, and now, Bobby Jindal. I wondered how John Bel Edwards would acknowledge Jindal, who wrecked Louisiana, wrecked the budget, wrecked health care and hospital finances, and wrecked higher ed finances to the brink of bankruptcy. Edwards thanked Jindal and his wife Supriya for a smooth transition. No kind-but-untrue words about how Jindal was a great act to follow. Edwards did reference “the state we all love.” Not Jindal. He loved himself to the detriment of the state. Much of the rest of Edwards’ speech was an indictment on Jindal, who had to smile through the entire slam because he was now the former governor and was seated at a formal event being filmed. Speaking of love, I want to thank the love of my life, my wife Donna, and our children Samantha Bel, Sarah Ellen, and John Miller. Also, I want to thank my mother, Dora Jean Edwards, and pay tribute to my late father Frank Edwards, Jr., who died while the campaign was underway. I miss him terribly and thank him for passing on to me a sense of service, commitment to others, and the value of hard work. I love my parents, siblings, and extended family and thank each of them for helping me stand before the state as Louisiana’s Governor. I especially want to thank all the people of Louisiana – those who have joined us here today and those spread out in each corner of the state. Like many of you, I also grew up with a strong appreciation for the sportsmen’s paradise we live in. Some of my best memories are of camping with my father and six brothers. Every year, we would float the Tangipahoa River to Manchac, eating whatever we caught or killed along the way. But just in case we came up empty, we’d always bring along some sweet potato pie left over from Thanksgiving. And my favorite memories are those spent sitting around the campfire on cold nights in discussion and debate with my family. The second step is to ask yourself – and knowledgeable people around you – what are our options to successfully address the challenge and which ones best fit our mission and values. That’s the choice of a strategy. We must be honest with ourselves and one another. I can tell you I’d rather be here today inheriting a billion dollar surplus, than a $1.9 billion shortfall, but there isn’t a challenge we won’t meet. We must be grounded in reality and see the facts as they are, not as we want them to be. We talk a lot about our abundant natural resources, but we need to talk more about the most precious natural resource God has entrusted to us – our children. In Louisiana, 1 in 4 school-aged children live in poverty. That’s unacceptable and it MUST change. Second, we’ve somehow forgotten that education is synonymous with opportunity. In the past 7 years, we’ve cut funding for higher education by 700 million dollars – the largest disinvestment in the country – putting campuses on the brink of bankruptcy, and sending many of our best and brightest students out of state. For K through 12 education, while we’ve had some improvements, we rank 49th in academic achievement. And while our high school graduation rate is at an all-time high, we still fall below the national average. We can no longer afford to lurch from year to year, cobbling together temporary fixes and expecting to realize permanent sustainability. If we don’t fix the structural budget deficit, we can’t fix any of our other problems. We should make a modest, but meaningful, increase to the minimum wage and the legislature should finally pass effective equal pay so that women, the economic leaders of many households, get the same pay for the same work. We know that when women do well – children prosper too. It’s been proven time and again that a more educated and trained workforce is our greatest long-term economic generator. So we MUST make college more affordable. We can start by ending double digit tuition hikes. We cannot fund higher education on the backs of our students. Our state should support our public higher education institutions. We must also increase need-based aid for students ready to enroll in colleges across Louisiana, and work towards a goal of funding higher education at 50% state support and at 50% tuition and fees. While all options are on the table, we’re going to make strategic budget reductions, increase efficiencies, accept OUR federal tax dollars back, and rework the failed system of tax incentives, credits and rebates, which bleed the state’s revenue and, too often, leave little to show for the spending. I can’t do it alone, and the enormous challenges we face will not be resolved overnight. But together, we will accomplish our mission. Now is the time for full participation. I am calling on the legislature to work with me and pass sound solutions, and I’m calling on the people of Louisiana to constructively engage and share your thoughts and ideas. The breeze of hope that got us here today will also drive a current of change as mighty as the Mississippi. But this river can’t flow unless the breeze continues. We must put action before idleness, unity before party, and citizenship before self in order to put Louisiana first. Like you, I’ve been here through good times and bad. We are not a perfect state, but we are a resilient one. Following shared sacrifice, there WILL be shared prosperity. I am bullish on our future. Louisiana’s best days are certainly ahead, and I want you to be as excited and optimistic as I am. Remember, after Katrina we battled back and, in fact, we still celebrated Mardi Gras. After the Red River flooded, families still gathered at the state fair. After the oil spill, we didn’t give up fishing for oysters and shrimp. The sugar cane still grows in Louisiana. Tourists still flock to the French Quarter. And new industries continue to emerge. If there are two things we’ll never run out of in Louisiana – it’s gumbo and gumption. As Solomon prayed, “So give your servant a discerning heart to govern your people and to distinguish between right and wrong.” That will also be my prayer. As WDSU was waiting for the inauguration to begin, University of New Orleans (UNO) instructor and political analyst Ed Chervenak was on air as a guest. The reporter asked Chervenak to grade the Jindal administration from the perspective of a neutral party. Chervenak responded that he was not a neutral party since he works in higher education. He commented on the gutting of the budgets of higher education and health care and of the need for changes in legislation to remove some of the budgetary protections in other areas that have left higher ed and health care susceptible to ghastly budget cuts. He also noted that with Jindal, Louisiana suffered because of Jindal’s focus on his personal ambition. Regarding John Bel Edwards as governor, what I am most enthused about is that he will not use the governorship to advance a national career, and he has no punitive view of teachers. He spoke about Louisiana ranking 49th even though grad rates went up, and I don’t believe he has thought through the reality that if grad rates rise nationally at the same rate that they rise in Louisiana, then the ranking will remain the same. But I did appreciate his acknowledging the reality that Louisiana needs to get its fiscal issues under control before other issues could be addressed. I was especially glad to hear him mention addressing the “bleeding tax revenue.” Our state is broke, yet we offer fantastic corporate tax breaks. That needs correcting. Also, when Edwards mentioned “challenging Louisiana standards,” the audience was silent– likely because no one knows (or trusts) such words, which, along with “I am for higher standards,” have become indistinguishable as either genuine or simply Common Core incognito. His words about “ending the overuse of costly standardized testing” was also good to hear, and I wonder what qualifies as “overuse.” Surely it will be a state budget issue. I expect it could also be an issue as concerns the dependence of K12 education on standardized tests– for grading teachers and schools. 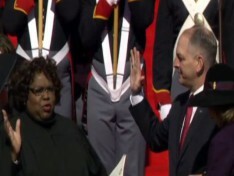 Edwards was sworn in as Louisiana’s 56th governor at 12:22 p.m. CST on January 11, 2016, by Louisiana Supreme Court Chief Justice Bernette Johnson. The only reason that our high school graduation rate in Louisiana is going up is because we are graduating students no matter what because otherwise, the school’s report card takes a hit! Lol. That guy gets around. I guess that means we had two Governors seeking presidential nominations this time around. Both are faring about the same with their education agenda. I think Bush has now fallen below where Jindal was when he dropped out. He has more money to burn, and a bigger family name to wave about. Still hoping for Trump to stop trumping him and the competition I’d wager. Mercedes, thanks for all this info re: Jindal. I am at least glad he had enough sense to drop out of the POTUS race early on instead of dragging it out like several other candidates. I am also glad that his ouster and the GOPs failure to elect their Gov. was probably a slap to Jeb! and to the Established GOP whom I consider the enemy for We the People, in their sheepskins over the wolves. No dif that Hillary and company. I would be interested in your personal take at this point for Pres. race? If you have one? I could NEVER vote for Hillary, esp listening to her endorsement by Planned Parenthood on CSpan2 which happened in NH last week. Life is #1 for me, with Security of Nation against enemies #2, and Education #3…. thanks for posting. i had to turn it off when the convocation began. really. ‘separation of church and state’. what a sham gov we have.